It’s been quite a while since I waxed lyrical about 40k and as I’ve been ploughing through the Horus Hersy novels as well as listening to all the audio dramas my thoughts have turned to the XII legion and their Primarch, the warrior king, Angron. 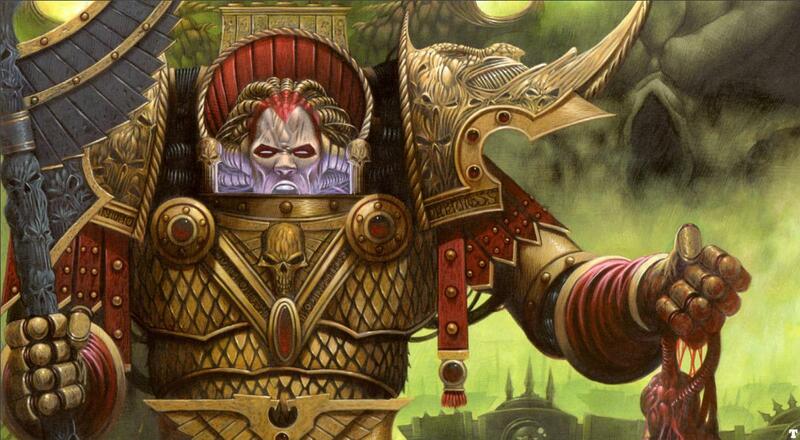 Of all the Emperor’s sons, Angron suffered the most at the hands the galaxy and his adopted home world. Whereas the likes of Guilliman, Dorn, Sanquinius and even Curze rose to dominion over the respective worlds they came to rest upon after the Scattering, Angron suffered mutilation at the hands of cruel masters, implanting the Butcher’s Nails deep within his brain. Driven to the edge of insanity, the Butcher’s Nails drove him to the most extreme acts of violence and in exchange they would grant him fleeting moments of peace and clarity. And after each fight he cut victories into his own flesh, further reinforcing the notion that his life was meant only for pain. The rest of the time he was exposed to relentless mental agony that pulled, thread by thread, at his ability to reason. It was inevitable that Angron started to love the Butcher’s Nails for they were the only thing that granted him that briefest moment of clarity, the slimmest window to be himself again. Having endured the worst kind of abuses it is little wonder that Angron chose to stay with his brothers during their defiant last stand against their captures when the Emperor finally found him. It is also little wonder that Angron was distraught when he was teleported aboard the Emperor’s flagship and forced to watch, via sensor feed, his brothers killed to a man. We’ll never know why the Emperor chose not to save Angron’s followers. Perhaps he knew they were too far gone. Too damaged, too tainted by the Butcher’s Nails. Perhaps he saw a glimmer of salvation in Angron’s tortured soul. Perhaps it was more to do with the Emperor needed Angron to leave the life of a gladiator and butcher behind him and be the general he was bred to be. He couldn’t have know how far gone Angron truly was or how deeply the bonds of brotherhood ran with Angron and his fellow combatants. Especially as it was only Kharn’s ability to draw parallels between the War Hounds (prior to being renamed the World Eaters) and Angron’s brother warriors that prevented Angron from killing Kharn along with the other company captains that had tried to reason with him. To make matters worse he was then expected to lead a legion in conquest. Angron, unlike his brothers, had never had the opportunity to study war beyond the walls of the grand arena. Although coded to have knowledge of tactics and strategems, their application did not come naturally to him. Angron was made into a cruel, sharp and brutally bloody instrument by his captors and that was how he trained his legion to wage war. The We can only assume the Emperor either hoped Angron would rise to the challenge, ignored just how broken Angron truly was or accepted that he was a necessary tool that would remain in his arsenal until after the conclusion of the Great Crusade. It’s not an unreasonable supposition as we know him capable of utter ruthlessness having already had two of his sons killed, and later the attack on the Thousand Sons. So Angron waged wars in the name of his father and for an Imperium he knew he could never be apart of or truly understand, and for his efforts he and his legion were treated with disdain and mistrust; their brutal methods of war drawing sanction from their brother legions and the Emperor himself for being what his father seemingly wanted him to be – a vicious and unrelenting weapon of war. And as much a threat as an actual fighting force. Only in the most dire of circumstances would prompt the more ‘civilised’ Legiones Astartes to call upon Angron and his sons for aide. The result was that Angron was not only abused and mistreated by people of authority – which he was largely used to – but also by those that would fight by his side and call him brother. Worst of all the Emperor was not only an authority figure who seemed to be ordering him into violence once more but was then punishing him for his actions. And as I suspect Angron’s relationship with his father never extended beyond cordial quickly began to resent him, bucking his authority all the while trying to earn his approval. Even when Horus became Warmaster and later betrayed the Emperor, Angron was still treated as a rabid dog that would be goaded and prodded and then set loose allowing others to distance themselves from the worst kind of warfare. And even when the Heresy had been revealed and the Traitors out in open defiance, Angron and his World Eaters were still brought up short by treacherous brothers who still considered them to be beyond the pale. It was only at the Emperor’s Palace that Angron and his World Eaters were truly allowed to wreak the devastation Angron engineered his legion to unleash because, as is so often the case with an abused soul, Angron had abused his sons by implanting each of them with Butcher’s Nails of their own. He saw to it that they knew the pain and madness that jabbed at his own mind. And only through violence and battle born bloodshed could a measure of peace be obtained. And thus he doomed them to a violent and bloody path to damnation. The sad thing is that Angron was always doomed, one way or another. 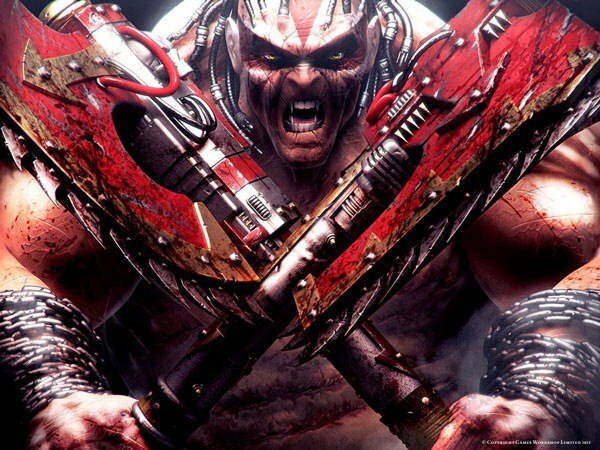 The Butcher’s Nails were Chaotic in origin and once implanted couldn’t be removed without killing the Primarch. And because of the nature of the devices he was always going to be driven to every greater excesses of violence which would have resulted either in him being killed in battle or the Wolves being set upon the World Eaters and destroyed. And probably at the cost of much of the Space Wolves Legion and Leman Russ himself. Perhaps that is why the Emperor let Angron be for so long, hoping he would burn himself and his legion out in their never-ending wars. His fall to Khorne was, it seemed, inevitable. He was too damaged, too full of hate and rage and was endlessly sent to die by a father that promised him an end to the abuses he suffered. Shunned by his nobler kin and manipulated by Horus and Lorgar, his fate was never in doubt. Especially as the Eldar appeared to make at least two attempts on his life to prevent him from becoming the Blood God’s greatest champion. And for all Angron’s blood-letting and the infliction of untold misery on the galaxy he is still trapped in an endless cycle, at the behest of is eternal master, in an effort to gain ascend beyond the reach of the Butcher’s Nails. In Betrayer there is a scene with Leman Russ confronting Angron, it is great. Good write up mate. I need to buy that book!